I admit, I was skeptical of a "We are the World" remake. Sometimes you just really don't want to mess with a Good Thing, especially if you risk tarnishing the original product. Well, my 2010 celebs made me proud....or maybe a song of this stature (especially at a time like this) is just impossible to mess up. I sound like a hater, right? Lol I'm admitting maybe I was wrong to not want a remake. I believe M.J. would be proud, especially because the main purpose is for a good cause. You can purchase this download and at the same time make a donation to Haiti. The performance debuted during the airing of the Winter Olympic games. I was surprised, some artist I hadn't seen in a while (Faith Evans..I think that was her), and some celebs I was surprised they let have the parts that they did (I.e. Lil Wayne & Kanye West). However, these are the big stars & they get the people attention & THAT IS the PURPOSE!! KUDOS. Take a look/listen. Did you enjoy the remake, or wish they would've left it alone? A few posts ago I shared with you a controversial Superbowl commercial, featuring Tebow and his mom, supporting a Pro Life stance. Well, apparently supporters of that ad are NOT alone. It was brought to my attention, another controversial ad being spotted around Atlanta, Georgia. There are 65 of these billboards around the city. Black Children are being called "ENDANGERED SPECIES". 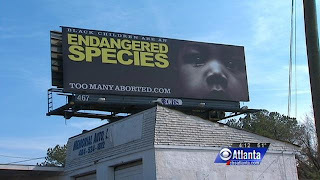 The headline of the billboard reads: "Black Children Are An Endangered Species. The anti-abortion group, "The Radiance Foundation", along with the anti-abortion group "Georgia Right to Life" sponsors the ad. The ads follow a belief that our community is supporting a silent genocide by aborting children, without giving them the right to life. I guess this argument depends on how you feel about abortion and abortion rights. This is always a touchy subject. To me, both arguments have good points. HEY!!! I LOVE THIS MAN!! Keeping with the spirit of the month of love, I decided to post a throwback. It is one of my favorite songs (if one can really choose) by my favorite artists, Mr. Stevie Wonder. Also in the spirit of Black History month, I would like to share some lil known facts about Stevie, because I'm sure we all know who he is already. Did you know.....? Stevie was born 6 weeks pre-mature, his blood vessels that support healthy sight, had not yet fully developed, attributing to his blind state. His legal name is Morris, which was changed after his mother left his father and moved herself and children to Detroit from Saginaw, Michigan. Stevie had his first hit at the tender age of 13. He is currently only 60 years old and still going strong.